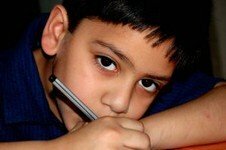 Asperger's syndrome, a form of high functioning autism, is an increasingly common disorder seen in school-age students. There is some dispute among experts as to whether Asperger's syndrome and high functioning autism are the same thing, but for the purposes of this webpage I will use the terms interchangeably. Tony Attwood - an authority in autism spectrum disorders - believes that the terms are equivalent in clinical practice. (Attwood, 2007) Children with Asperger's syndrome have typically developing intellectual and language skills, but often have great difficulty with social language. A feature of the syndrome is a fixation or obsession for one particular topic and in some case, a flat monotone voice prosody. Asperger's syndrome can be quite difficult to diagnose as there are not specific standardized tests that accurately test for it. The DSM IV (Diagnostic and Statistical Manual of Mental Disorders) is not a huge help either, and doesn't mention the social language aspect of the disorder. So not much help is at hand there either. Children with Aspergers can often do reasonably well on the CELF-4 (Clinical Evaluation of Language Fundamentals)and equivalent language assessments. This is because children with high functioning autism tend to use complex sentences and grammar very well. Their syntax and grammar skills are often within the typically developing range, or even above average. Children with high functioning autism can often sound like miniature adults, particularly when they talk at length about their favourite hobby or interest. Children with aspergers can be quite clever at masking their social language problems by having an intellectual understanding of what social rules are. So on a standardized language assessment children with Aspergers will often figure out what the social rules for a situation are, and provide an appropriate response. But, if children with Asperger's syndrome are in a real life social situation, with all the fluctuations and rapid changes that is typical of social language, they can quickly flounder or feel overwhelmed. They may consistently misread social cues and/or have little to no interest in conversations that are not focused on their preferred topic. Children on the autism spectrum are also more likely to suffer from sleep problems or sleep disturbance. Please link to this web-page for more information about autism and sleep disorders. There are several intervention methods to improve social language skills of children with Asperger's syndrome. One of the more popular and effective is Carol Gray's, Social Stories.